Meet the BCZRCCR Porsche 911. It's got a "Preserve Our National Parks" licence plate from the state of Washington, a tuned engine, the colors of a Plymouth truck and the biggest ducktail ever. It rocks! But don't think for a second that the BCZRCCR is your average beefed up 930. 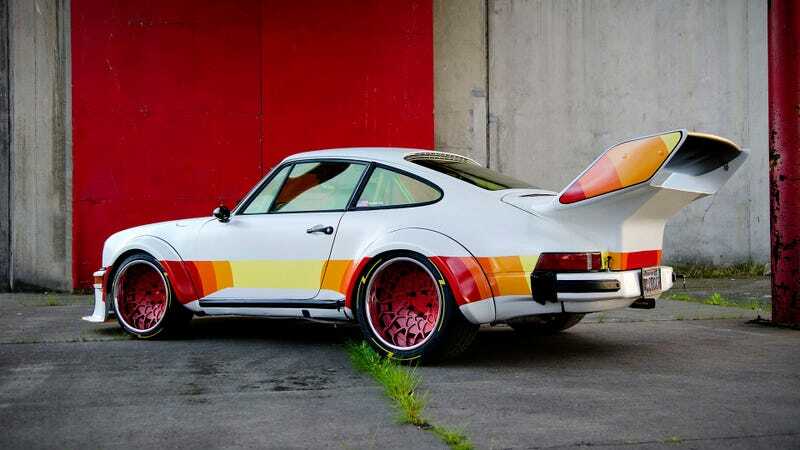 It was based on the 934/5, the Group 4 racing version of the Turbo. With somewhere between 480 and 550 horses and a curb weight of 2,403 pounds, that car was a pretty special set of wheels in 1977. On a limited budget and a strict timeline during off hours from work (I am involved in the industry), many all nighters and weekends were spent on the car over the course of about 3 months prior to its "unveiling". It's a dream to drive! I have several test and tune track days coming up, on the street its very fun and even daily-driveable. I haven't dyno'ed the car since the modifications and honestly its not about the power for me. The car was built as a lightweight momentum car to be able to carry speed through corners. It has only been finished for a couple weeks now and it will continue to evolve. You can check it out for yourself thanks to these great photos given us by Travis Cuykendall.